Do you use your mouse more than your keyboard? If you are an excessive user of mouse who goes back and forth between your mouse and keyboard,here is a small tip to let you protect your arm from tiring out quickly. The best solution is ofcourse learning keyboard shortcuts for your mouse operations.Most people use their mouse for the most common tasks on the computer.For example, any time they change a setting on their PC/computer, they use their mouse to press OK for it to take effect. Isn’t it a little repetitive to have to press that button every single time? How would you like your mouse to automatically do it for you?How do you do that? You just have to enable the “snap to” feature for your mouse. Go to Start–>Control Panel.Choose the “Mouse” link(sometimes “Mouse” link may be found inside “Printers and Other Hardware” link) and then click on the “Pointer Options” tab. The second choice there is “Snap To”. Checkmark that box against “Automatically move pointer to the default button in a dialog box” and click “OK”. From then on, your mouse pointer will automatically move to the default button in any dialogue box. 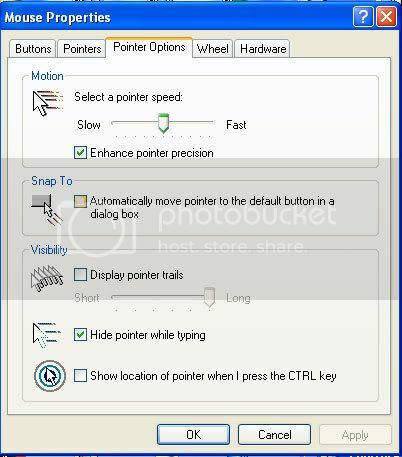 Every time you’re doing something on your computer, the mouse pointer will take care of the finishing touches for you and you won’t have to worry about moving your hand back over to your mouse. Is this simple tip helpful for you? Mouseless may soon replace a wireless mouse. Will it be Keyboardless next? How to connect laptop to TV or computer to TV? Yes, such small tips are very useful in practical uses, and save you time. Yes they do…am glad you liked it.. This is a very useful tip, but problem with this one is that sometimes you may get annoyed as it snaps to the default one. kanak’s last blog post..How do you feel when your comment is caught by a spam protector plugin ?? This is a nice feature that I have known about for sometime. What I would like to know is how to make this change permanent. If you need to reboot then you will have to reset the snap to pointer option. If you look on the picture above, at the bottom it has a box for a tick to show pointer using control button. Obviously Kanak’s friend has this set. Just like the bottom taskbar hiding automatically the mouse cursor does the same, so as it’s not in the way when your reading or typing. Just press control and your cursor will show.